In Sept, I thought I wouldn’t be having my annual Holiday Studio Sale, but after many queries and with the addition of new outside steps down to my studio, IT IS ON! Just later than usual. Instead of it being the long-established first weekend in Nov (to avoid potential snow), this year it will be the first weekend in Dec. All details below, please save the dates, and we hope to see you, snow or shine! If you are too far or can’t swing by, my online shop is full for black Friday, cyber Monday, and every day before and after. I do have more cups (stamped & Deluxe Clover) than are listed, so if you don’t see what you want, drop me a note. Otherwise, there’s a nice variety all ready to ship. I’m always happy to send gifts to the giftee and include a personal note, which is easy to fill out at time of purchase. Thank you for supporting elegant and handmade from my studio! Note: The last day to purchase for Christmas arrival is noon Mon, 12/17. Bring some handmade elegance home for the holidays! This sale includes gallery-quality pottery as well as “aesthetic” and “minorly flawed” seconds*. Early birds claim the best finds! Cash preferred; checks and credit cards accepted. Baldwinville is in Templeton, just west of Gardner and about 3 miles from Exit 21 off Route 2 near Route 68. We’re centrally located about an hour or less each from Framingham, Worcester, Northampton, and Shelburne Falls, MA as well as, Keene, NH and Brattleboro, VT. We do recommend using GoogleMaps or GPS for the best directions from your particular location. We live on a busy road, and there is no parking in front of our house. Parking is best in our driveway or on the opposite side of the street. Please be considerate of our neighbors. My studio is in a walkout basement, so entering the sale requires using stairs either outside or inside. about independent business and handmade design. 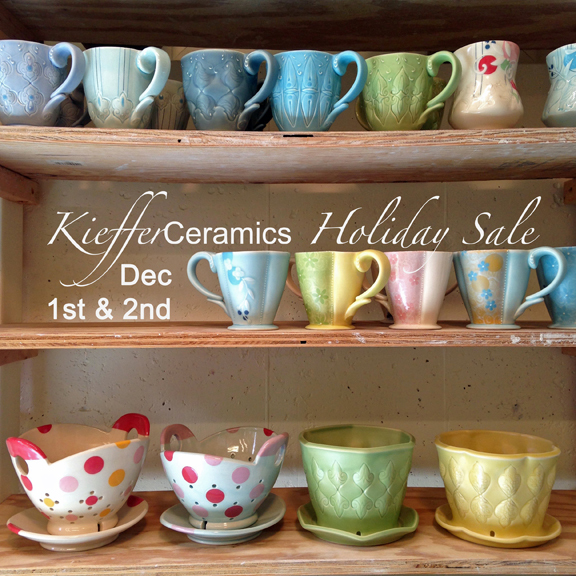 Drop me an email if you have questions or would like more info, KiefferCeramics@gmail.com. * I don’t recommend gifting seconds, but they are perfect price-savers for you to take home and treasure. I’ve updated my online shop with dozens of new lovelies for buying and gifting. Shop for Mom’s Day thru noon, 5/7 to insure timely arrival. There are planters available for the first time in years, a variety of cups in all styles and colors, and much more. And for local New Englanders, my Spring Studio Sale here in north, central Massachusetts is Mother’s Day weekend! Shop gallery-quality pots, plus “aesthetic” and “minorly flawed” seconds. Early birds claim the best finds! For fun, you can RSVP here. Baldwinville is in Templeton, just west of Gardner and about 3 miles from Exit 21 off Route 2 near Route 68. We’re centrally located about an hour or less each from Framingham, Worcester, Northampton, and Shelburne Falls, MA as well as, Keene, NH and Brattleboro, VT. We do recommend using GoogleMaps or GPS for the best directions from your particular location. My annual Holiday and Seconds Sale is here! Fellow New Englanders can snag a second (or several!) for yourselves and firsts to gift friends and family. You will be treated to local cheeses, an energetic doxie, and a crazy selection of discounted discontinueds, prototypes, aesthetic seconds, and of course, awesome firsts. Plus, you can check out my hubby’s new wood shop! *Don’t forget to “fall back” an hour! Cash preferred, checks and credit cards accepted. Baldwinville is in Templeton, just west of Gardner and about 3 miles from Exit 21 off Route 2 near Route 68. We do recommend using GoogleMaps or GPS for the best directions from your particular location. We’re centrally located about an hour or less each from Framingham, Worcester, Northampton, and Shelburne Falls, MA as well as, Keene, NH and Brattleboro, VT.
My studio is in the basement, so entering the sale requires using stairs either outside or inside. by buying and giving handmade. I’m excited to invite my fellow New Englanders to swing by my studio for some good deals before the snow begins to fall here in north central Massachusetts. It’s a perfect opportunity to check out my studio and my hubby’s new and in-progress wood shop, and shop firsts for holiday gifts, as well as some rather wonderful ‘aesthetic’ and ‘minorly flawed’ seconds to save for yourself. We are just a couple miles from a local cheese shop and chocolatier, and about an hour or less each from Framingham, Northampton, and Worcester, MA as well as, Keene, NH and Brattleboro, VT. Visit my Events Page to read about the full details, including address, payment options, parking, and accessibility, or drop me an email if you have questions, KiefferCeramics@gmail.com. The 2013 Pottery Invitational Show & Sale at the Worcester Center for Crafts (where I teach adult classes) is April 5th – 7th, 2013. I’m so pleased to be a part of this great two and a half day exhibition and sale that was curated by fellow potters Hayne Bayless and Hannah Niswonger. The show comprises a fantastic group of twenty-one studio potters from New England who will be standing side-by-side with their work as well as demonstrating for the weekend (including me), making this an exceptional event! Visit the link to read all about events within the event, details, and times here. Artists include Hayne Bayless, Dan Bellow, Molly Cantor, Autumn Cipala, Arthur Halvorsen, Robbie Heidinger, Jody Johnstone, Martina Lantin, Michael McCarthy, Hiroshi Nakayama, Hannah Niswonger, Kiara Matos, Tom O’Malley, Francine Ozereko, Rob Sieminski, Brian Taylor, Sam Taylor, Holly Walker, Tom White, Adero Willard, and myself. It’s a must attend event for my fellow New Englanders!